Steven (Chicagoland, United States) on 10 December 2013 in Animal & Insect and Portfolio. 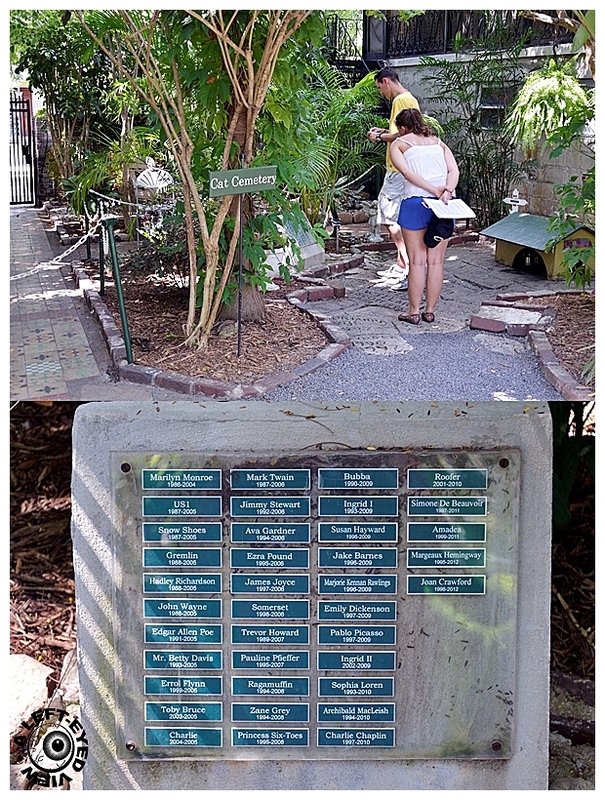 The Ernest Hemingway Home and Museum in Key West, Florida is home to approximately 40-50 polydactyl (six-toed) cats. Cats normally have five front toes and four back toes. About half of the cats at the museum have the physical polydactyl trait but they all carry the polydactyl gene in their DNA, which means that the ones that have four and five toes can still mother or father six-toed kittens. Most cats have extra toes on their front feet and sometimes on their back feet as well. Sometimes it looks as if they are wearing mittens because they appear to have a thumb on their paw. Ernest Hemingway was given a white six-toed cat by a ship's captain and some of the cats who live on the museum grounds are descendants of that original cat, named Snowball. Key West is a small island and it is possible that many of the cats on the island are related. The polydactyl cats are not a particular breed. The trait can appear in any breed. They vary in shapes, sizes, colors and personalities. Hemingway named all of his cats after famous people and that same tradition is carried on today. Including those listed on the headstone pictured above, other names of cats included Tigger, Kim Novak, Willard Scott, Frank Sinatra, Marlene Dietrich, and Liz Taylor. These names were spotted on the stepping stones that the woman is standing on in the upper photo. Photos captured September 25, 2013. Thanks for sharing the picture and story. Yes, thank you for the text and picture. Merci pour les explications, très belle image. Ha ha, a well idea. I don't know this story. Thanks for sharing it. A great find and interesting collection of personalities judging by some of those names! Superb ! Very interesting . I love the way you set up the photo, very well done. This is an interesting image with a great narrative. I hope you really enjoyed your trip to Key West. Very informative post and an excellent image to illustrate it. Very good framing. Bubba lived among some famous "people". I used to have a polydactyl cat. His feet looked like he had on mittens. He had the most wonderful personality of any cat I've had. I would love to have another one like him. Happy Silly Tuesday!! PS A photo of my polydactyl cat was posted here. @B. Thomas: Thank you for sharing! I didn't think they were all that common. Thanks for this share for the photo as well as the history. One of my cats, probably a favourite in my lifetime, has the extra toes and she is one great mouser. Fabulous and fascinating post today, Steven. Very interesting story, never knew about this. I guess that fits for Silly Tuesday. Wow, that is nice that someone looks after them. I think that the cat cemetery is rather charming! Happy ST! Interesting scene … that is so neat the tradition of naming the cats after famous people and to keep the tradition going too is great! Strange and very interesting! An excellent find.